It is getting ready to get real expensive.....LOL.......I know first hand. Sarah finished up a playday series at our church Sunday. She won highpoint for the sub juniors spring series. Even lost her stirrups on the barrels and still won first place in barrels. kid is progressing nicely. Here is a link to the video I put together from her Sunday runs. Last edited by bowhuntertex; 05-21-2018 at 03:28 PM. Brandon how did your daughter do in Chickasha last weekend? 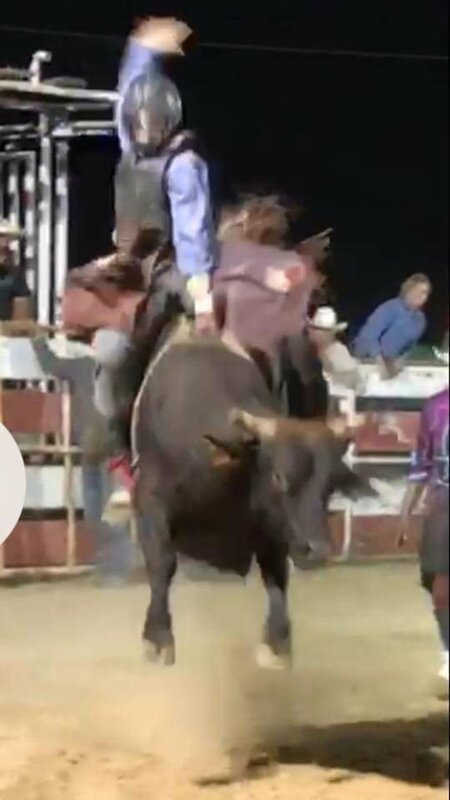 My son Clay riding a rank one last night. How's that bullrider doing today? Still praying for a full recovery. He will be back to riding for 8 in no time. She finished I think in the top 10 out of 68. She said Lucy didn't run. Sounds like we need to get her hock injected again with plasma. Nice. Hope the horse is OK. How is the new horse working out? I know how that goes. We have had a mare for 2 years that I bought for my daughter’s step up horse and she will not ride it. I told her this summer she had to ride it or it was going to be sold. I agree. It doesn't matter how ****** the horse is if the kid doesn't have 100% confidence in it then its a waste of time and money. And that is why I now have a horse I am working in the roping pen for myself. Maybe one day Sarah will do break away on her. Sarah picked up some more hardware last night from the Hays county 4-H point show series banquet. Jr. High Point in the speed division. Hopefully she can carry this over to the district show next month. Thanks. She was super proud of winning this one because she was the youngest in her class. For her no. It is pretty dang big and she is tiny. She might be able to wear it when she becomes an adult, LOL. She has won several this size and I have never understood why they give such big buckles to little kids. Good thing is she has 4 or 5 others she can actually wear. I guess this one will just sit on the buckle display shelf that I am building for her. Ok. Every buckle my daughter has won she can wear. It is a head scratcher that they would give a buckle that big to a little kid. The picture is probably playing tricks on me though so it probably isn’t as big as it looks with her holding. Awesome accomplishment no matter what. I was thinking the same thing!! That buckle is huge. Riley never rides wearing a buckle. She had one get caught on the saddle horn once and dang near caused a huge wreck. Congrats to Sarah!!!! Well my daughter had a strong pole and barrel run last night in Gustine. Don’t know where she placed but she ran good. Riding there again tonight and tomorrow night. How did she end up over the weekend? Nothing for us this past weekend. She has a break until the 9th. The Wimberley 4H puts on a rodeo every year for a fundraiser on Memorial Weekend, so I was busy helping out with that all weekend. My kiddo helped out as well at both the contestant gate and the concession stand. Riley's at the JR High Finals this week. Weird that she isn't running Barrels. She missed qualifying by 1 point. But considering she ran her roping horse at 9 out of the 12 rodeos cant be to disappointed. She has really been working out with the battle rope and it shows. She has really slimmed down and toned up. My daughter did ok for the long weekend of rodeo. She finished 6 place out of 35 in the barrels on the 3 day average and she finished 4 place out of 28 in the poles. She had a couple of hiccups but she ran strong for 3 days. It rained Friday night so that slowed everything down. This is over in Gonzales isn't it? My neighbors kids are there competing. Let me know what days she runs and I might be able to swing over there and watch. That's still a good weekend. Hopefully this new horse works out for her. She's is tying goats tonight. What time does it start? I will be in New Braunfels until 7pm. You gonna be out there? I hear ya there. If it starts at 6 I doubt I can get there quick enough. Hope some of y’all can make it. If you’d like to donate something for the silent auction and raffles contact me on here or at 361-675-6302. Thanks and God Bless! Good Deal. Riley had the Jr High Finals last week and it didn't go as planned. Friday she was in Weatherford trying horses. Think we found one that will take her to the next level. Getting Vet checked this week. He has over $40k in PRCA earnings which is what w were looking for. Sat she ran in the CPRA Rodeo in San Saba. Made a nice run but not in the money. This week she will Run in Stephenville Tuesday night, Llano Friday night and Bandera Sat night. If we get this new horse we will really make a push to get to the CPRA finals. Great. Hope you find a good horse. That's good stuff right there, congrats. Can't wait to see what she can do on her other horses. We had an off weekend this week. Small playday Saturday and waiting on my daughter to make a decision on going to the Cowboys for Indians barrel race Sunday. How did ya'll do in Goldthwaite? Sarah finished out the series in Blanco strong and added another buckle to her growing collection. 3 firsts and a second place to finish in the top spot in the 8-10 division. Up next is our district 4H show next week. Riley had a so so weekend. Made a good run in Llano and was just out of the money in the open. In Bandera I think she was 4th on Jesse. This weekend she will run in Stonewall at the Peach Jamboree !!!! I haven't been in a long time but when I was rodeoing it was one of my favorite open rodeos. What night is she up? Sarah and I may come watch. I was thinking of going up there since it is so close. Well let me know. I think Sarah would enjoy watching Riley run. Will Do. She mostly likely will be riding her new pony!!! We did OK. My son rode the new horse on Friday night and loped a barrel and pole pattern. He had never been on the horse so it was good. On Saturday night he rode his normal horse and was not ready for the speed the horse wanted to go. He corrected him on barrels but broke the pattern in the poles. Yeah. Thats why I don't like going to them. So glad Riley is at the Level she can compete at the CPRA rodeos. But lord knows I've been to my share of those all day and night Marathons!!! The AJRAs aren't to bad either. Those kids at all age groups go in running all out. We have to pay our dues right now especially working on some new horses. Hopefully the kids will end up competitive enough to move into larger associations events. My daughter has now decided she wants to rope as well. Tres and his partner won the The TJHR Region 8 Team Roping saddled. Tres also placed 3rd in tie down in rodeo 10. Super proud Dad! Well it's official Riley has a new barrel pony!!! Welcome Gator, aka Tator, aka Mator aka CEO Kinda Beautiful!!! This Big grey is a proven winner in the PRCA with over $40k in winnings and more in barrel racing and amateur. I asked Riley tonight new horse new goals what are they? She said " Dad, win AJRA Finals Average, Qualify CPRA Finals win average and Rookie of the Year, Qualify for JrNfr and go back to Vegas, and to make a run for the American and run for a million dollars. ". Baby girl shoot for the moon and land amongst the stars. You now have two A team ******ez in your stable now to get you there!!! Let's go chase those dreams!! !